Our team of engineers has successfully developed a wonderful range of radiator ducting services. Our services are thoroughly popular for complete performance and long life. We at AE engineer our range under the prescribed industry quality standards. This assures that our products show durability and thorough weather resistance. Backed by our team of experts, we are engaged in offering a wide range of Radiator Ducting Service that is highly acknowledged for excellent performance and longer serviceability. We design and develop our range as per the industry quality standards, make our products durable and weather resistant. These ducting are lightweight, easy-to-use and available in varied sizes to meet the requirements of our esteemed clients. In addition, we also offer customization facility to ensure long lasting service. Our ducting system proffers exceptional chemical resistance to broad spectrum of corrosive fumes, gases and fluids. The ducting systems manufactured and supplied by us are easy to handle and install. 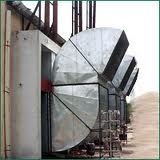 Looking for Ventilation Ducting Services ?